The third entry in our five-part series aimed at helping you figure out when it’s time to replace your mattress requires that you give it the ol’ eyeball test. Noticeable visual wear of a mattress is almost always connected to the physical feel of its wear, but because it’s so hard to tell that something is slowly losing its best qualities, inspecting your mattress periodically is a beneficial tip. It may seem simple that if a mattress looks worn out it should be replaced, but at the same time, the moment a soft bed has passed the point of no return, it doesn’t morph into the Rocky Mountains either. We rarely take a good look at our mattresses due to our busy lives. Consider how often you examine your mattress, without blankets and sheets. Chances are if you do, you probably know a lot more about your mattress than the average individual. But if you don’t, it is exactly what you should be doing. If your morning schedule is based around maximizing your sleep before getting to class, work, the gym, or appointments, you likely hop out of bed leaving a mélange of memory foam pillows, sheets and covers in your wake. Maybe you set aside a minute or two to make your bed, leaving a crisp, smooth surface. And when it’s time to go to bed, the last thing you want to do is add another item to your day’s ever-increasing to-do list. If your habits resemble these, even in the slightest, you may be missing signs that your mattress is wearing out. One easy way to keep a watchful eye is to give it a once-over every time you wash your sheets. With covers swirled in every direction, an unmade bed isn’t going to show any mattress flaws. And while it may seem like a crisply made bed would expose signs of wear, taught, tucked sheets may be stretching over low points or wrinkles and masking them. When it comes time to wash your bedding, clear the mattress of everything, comfort pads and allergy covers included, so you’re looking at the surface of the mattress. Step back and inspect it for sagging or lumps. Stains may indicate water damage, potentially signaling the presence of irritants like mold or mildew that can be a detriment to your sleeping experience. After the eyeball test, firmly run your hand over the mattress to see if it feels smooth, strong and consistent. If the direct pressure from your hand is falling into dips or hitting hard spots, imagine the impact your full weight has on the mattress. Paying attention to any squeaking or creaking when you move on a mattress is another way to monitor wear. 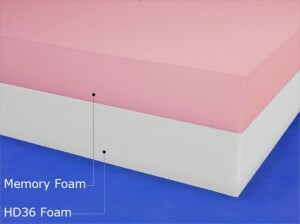 A latex or foam mattress will always remain quiet because of its design, but noise is one sign that an innerspring mattress is on its way out.